FREDERICK – Three arches mark the entrance into St. Katharine Drexel, as well as the doorway leading from the vast narthex into the worship space. The motif, which appears throughout the new building, refers obviously to the Holy Trinity, but parishioners are likely also thinking of the three locations of their community over 18 years – a theater at Frederick Community College, the multipurpose room of St. John Regional Catholic School, and finally their new church at 8428 Opossumtown Pike, adjacent to the school. “I’m dying to see it,” said Cathy Smeak, a cantor who has been a member of the community since it was an unnamed mission of St. John the Evangelist Parish in downtown Frederick in the late 1990s. She won’t be disappointed. The building, which is set to be dedicated Nov. 11 by Baltimore Archbishop William E. Lori, includes repurposed stained glass from the former St. Martin in West Baltimore, carved Stations of the Cross that adorned the Basilica of the National Shrine of the Assumption of the Blessed Virgin Mary for more than 50 years, and curved wooden roof trusses fashioned to recall those of the chapel at the motherhouse of the Sisters of the Blessed Sacrament, the religious order founded by St. Katharine Drexel. The church, which seats 700, also has a café for coffee and doughnuts (or Saturday wine and cheese), three classrooms for children’s ministry, vertical panels of flowing holy water and a subtle video screen above the sanctuary on which parishioners can follow hymns, prayers and readings. “The intention was to build a modern church honoring classic church architecture,” said Father Keith Boisvert, who has led the congregation since its Frederick Community College days. He paused before comparing the final product with the vision that had lived in his head. As previously reported by the Catholic Review, two successful capital campaigns, launched by the parish in 2008 and 2012, secured $2 million and $1.85 million, respectively, for the $6.5 million church building, according to Father Boisvert. Thanks to further campaigning, the church has raised enough up-front funding to keep the mortgage down to 35 percent of the cost of the new church. It was designed by Noelker and Hull Associates and built by Conewago Enterprises. “It’s beautiful, isn’t it?” added Greenholt, a parishioner of the Annunciation of the Blessed Virgin Mary in McSherrystown, Pa. 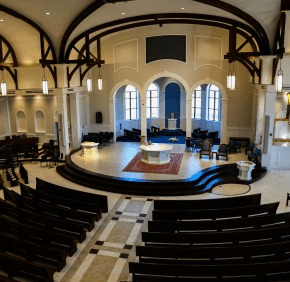 The last new church built in the archdiocese, also in the Frederick area, was dedicated in 2014. St. Joseph-on-Carollton Manor’s new building in Buckeystown seats 500. In June of this year, the archdiocese broke ground on a new church for St. Lawrence Martyr in Jessup; the first phase is expected to be completed in the summer of 2017. To view more photos or purchase prints, visit our Smugmug page here.